Regrexit. Really? Oh, how we love combining two words into one in clever ways. It’s what the French call a portmanteau. Case in point: how the marriage of Ben Affleck and Jennifer Lopez was called “Bennifer” by the media. Here are some takes on Brexit for the business world, particularly for the finicky and faddish marketing profession where media, tools and tactics can quickly come and go. Contexit – when you lack enough context or insights about customers, prospects, competitors or potential markets and, as a result, have to bail on what you’re doing. Or when content marketing falls short. Contexits are often the result of data or knowledge gaps that can be filled. (Warning…not so subtle plug coming….Boundless Markets fills these gaps with quantitative research for thought leadership and decision making, customer interviews, data audits and user videos that shed light on perceptions of websites). That’s it. I have to Mexit now (leave to eat some Mexican food). I’m just back from Denver, where I spoke on data-driven customer success and marketing to groups of software executives. It was the same week that Microsoft acquired LinkedIn. In other words, good timing to talk about engineering products so that marketing is built right into those experiences…which is a big driver of Microsoft’s strategy. Many pundits have called on Microsoft to retain LinkedIn’s autonomy and to not bake it into the mother ship in overtly commercial ways. But when you buy a company for $26 billion, you can bet there are big plans for for synergies. It begs the question, how will Microsoft monetize their new prize? One clue lies in looking at the competition, Google and Apple. Those companies have engineered their products to created an ecosystem, so that using one product naturally leads into using another product. (For example, Apple’s Facetime connects users on Ipads, Ipods, Iphones and Macs, which is why my kids make fun of me for using an Android phone when I have a Mac computer). Microsoft has traditionally not been great about building a product ecosystem. Expect that to change. According to Chris Caposella, Microsoft’s Chief Marketing Officer, their strategy involves four parts: acquire, engage, enlist, and monetize. Acquire is Microsoft’s way of getting people to use a product for free. Engage is Microsoft’s plan to get them hooked on the product and leverage other parts of its ecosystem to keep someone using the service. Enlist is simply finding fans to keep the circle going, and then monetizing is figuring out who will pay for subscription versions of the service they’re hooked on. Improving Office, with LinkedIn connections. E.g. preparing emails to a sales prospect and seeing all your connections at that company (and dozens of other use cases). Office is a big part of Microsoft’s $6.7 billion productivity and process business, which needs a boost. Their revenues were down 2% last quarter. Improving Microsoft’s CRM offering, by including connections with companies. If CRM is ultimately about managing relationships, what better vehicle for that than an existing social network with its built-in insight about who is connected to whom? You can imagine LinkedIn features with hooks into Microsoft’s CRM, and vice versa, and new freemium offerings. Making LinkedIn more of a workflow tool by embedding Microsoft functionality like OneNote (their note taking app), so LinkedIn users can easily see and share their ideas and thoughts — on any device — as part of the LinkedIn experience. In other words, if Microsoft tools can make LinkedIn more useful, then LinkedIn’s hooks into Microsoft products will be even more valuable. Their goal should be to make this a virtuous cycle. They have already begin embedding OneNote into SurfacePro 3, for example. Data mining to improve user engagement, cross-sells and up-sells across the Microsoft product suite (or at least parts of it). LinkedIn is a data machine. When you combine millions of users with data on relationships, content preferences and professional education (via Lynda.com), Microsoft should be able to monetize LinkedIn in ways LinkedIn as a standalone company was not able to. In a broader sense, there are ways to build an ecosystem around your company, even if you don’t have a software product. Here are some thoughts on doing that the “Google Way” in one of my previous articles. It’s all about getting closer to the center of your customer’s universe. How are you segmenting your content? Segmentation, one of the golden oldies of the marketing profession, applies to content. It’s important to not only know what content speaks to your paying customers, but also to the “tire kickers” you can engage to start doing business with your company. But instead of looking at macro level stats among prospects, it helps to drill down with meaningful metrics among specific segments. For example, how often do VIP prospects come back and revisit your website? What topics and what kind of content drove that behavior? 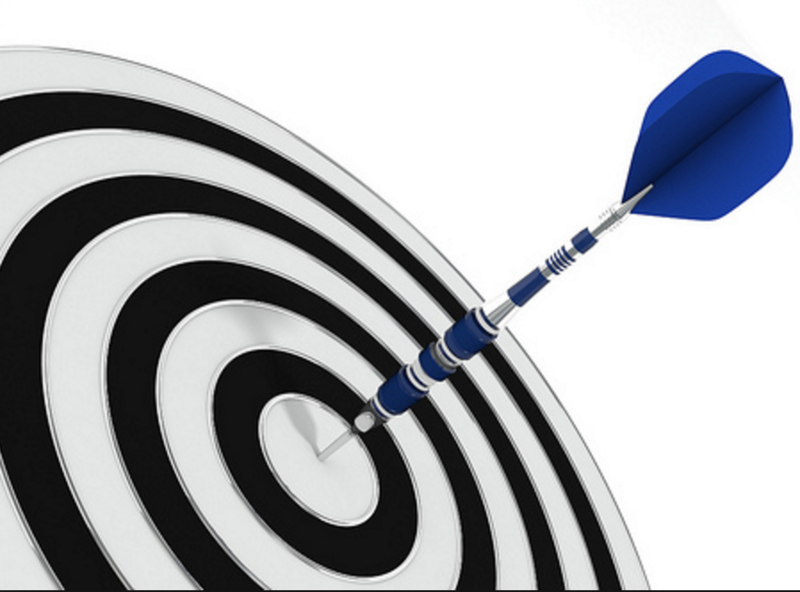 The key is to segment your prospects who are at the beginning of the marketing funnel, e.g. new sign-ups to a newsletter etc. When your list is enriched with data (from third parties or internal sources), it is easier to create more meaningful segments and then you’ll be in a better position to engage high potential prospects with relevant content. One of our clients, a K-12 education company, had a “math concerned” segment. After gaining some data, we created a free math assessment tool that was part of a broader customer acquisition strategy and revenue gains soon improved by double digits. Content segmentation, of course, also applies to customers who are already on board, not just prospects. Many companies are connecting their CRM systems to their analytics software, so they can understand which topics resonate most among different customer groups with real granularity. This way they know the specific topics and types of content that are moving the needle (in terms of lead score, purchase frequency, recency, monetary value etc). Ecommerce retailer Onward Reserve moved from a ‘batch and blast’ strategy to content segmentation that included best customers, non-purchasers and churning customers. The groups were sent the same basic emails but with different content and messaging that was tailored based on previous engagement with their website. They doubled their conversion rates and improved their average order value by 39% as a result. The content game is becoming more predictive. Mashable uses data scientists to predict the likelihood of their content of going viral. Recently I had the pleasure of meeting Haile Owusu, Chief Data Scientist at Mashable. Owusu discussed how their approach to predicting content performance is similar to weather forecasting, the oldest data science in the world. They’ve gotten so good that within five minutes after a piece of content is published, they can predict the “velocity of sharing” with 75% accuracy and this number grows to 95% accuracy within 24 hours. To do this Mashable looks not only at engagement with their own content, but also at content across the web. To feed their content models, every day they crawl 1 million different URLs and 5 million social data points. Of course, not every company has the scale to justify this kind of investment. But predictive analytics are becoming attainable through cloud based tools, particularly with marketing automation. Kapost reports a 250 percent increase in ROI when marketers incorporate predictive analytics tools into lead scoring—and content is the fuel that drives engagement, which makes lead scoring possible. Some vendors like Enfusion even predict which keywords to use in content creation (based on analyzing traffic, conversions, SEO value and more). 3. On a budget? There’s always Google Analytics. See the impact of short form content vs. long form content that has a higher word count. Group your content by author. Which authors drive the most traffic and revenue? Group your content by department of company. Are certain departments producing better content? Google even built a tool called Content Experiments that helps you conduct A/B tests to see what content performs best. (Actually, well informed sources told me Google acquired some technology to make it, but still let’s give them some credit). 4. Headlines and Titles Matter. I’m not advocating for salicious headlines that make for click bait. But carefully crafted headlines that capture the imagination can make a real difference. Recently Source Media helped a client with a piece of custom content. The client’s headline was “Survey of State Tax Departments.” The Source Media team suggested “How does Your State Tax Department Stack Up?” which was tested vs. the other headline. It resulted in a 146% increase in clicks. 5. Still not a believer? Consider Google’s Algorithm. Not everyone is drinking the data-driven content Kool-Aid. But don’t we all want more traffic from search engines? On May 20, 2014, Matt Cutts tweeted that Google was rolling out Panda 4.0, an update to their ranking algorithm. Remember the companies that lost huge amounts of traffic? It was the content farms (sites that quickly generate and publish low-quality and thin content) that suffered the biggest losses. When your content is more engaging Google will take notice. And when it’s not engaging they care. In particular…. A high bounce rate can signal to Google that your visitors aren’t finding what they’re looking for on your site, or that they don’t consider your site to be very useful. If your site’s visitors only come to your site once, never to return, Google can take that fact to mean that your site isn’t all that relevant or useful. Building a data-driven content culture takes leadership from the top. And since marketers are “the new publishers” they can take some good lessons from the media and publishing world. Take Mashable for example. Pete Cashmore founded Mashable.com at age 19 and grew it to two million readers within 18 months. In an interview with Inc, his passion for the numbers was clear. “I would look at the stats everyday and say, “Have I beaten yesterday?” And almost everyday I would have beaten yesterday in terms of the number of people who were reading the site. So, that kind of kept me going.” With leadership from the top, Mashable’s audience exploded. Today they have 45 million monthly unique visitors and 25 million social followers. At Penton, our data-driven content initiative was backed by the CEO and executive committee. We developed personal content dashboards for every editor in the company so every author could see the metrics for the content they created. We encouraged friendly competition and set up internal sessions where editors shared what works with their colleagues. This way, content creators weren’t just hearing a mandate from the ivory tower, they got helpful feedback from their peers. Performance was measured with common metrics on engagement across all of our 70+ brands, starting with benchmarks and goals for every brand. Ultimately we began to shift the culture. Today, Penton has high potential data products that are creating new revenue streams for the company. In order to win the content game, you need the resources to win. Outbrain, the content syndication platform, has multiple data scientists on staff whose job is to inform the content mix so that Outbrain’s content recommendations receive the maximum engagement. They are staffed up to win the data-driven content game. Who is on their team? Data scientists, engineers with experience in machine learning and even a VP of Recommendations. If you don’t have – or can’t justify – the resources to handle it internally, there are outside communities of data scientists like Kaggle that offer a more cost-effective way to harness a ‘cognitive surplus’ of top data scientists. And if you don’t have enough usage or scale for a big data project, there’s always the tried and true method: creating new accountabilities and roles in your organization centered around analysis. Some content creators feel that the numbers can stifle their creativity. Most content people are creative souls who want their originality and perspective to shine through. I’ve been there personally (and wrote for the Wall Street Journal when I was twenty). Somehow, along the way though, I became more of a geek and learned that being driven by metrics does not necessarily imply a lack of creativity. On the contrary, it can provide helpful context and a framework to guide creativity in directions that bear the most fruit. If you’d like to learn more about this topic, here are a couple of resources for you. 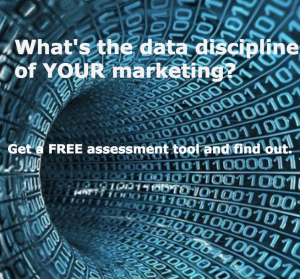 A free data assessment tool that can help you understand the data discipline of your marketing. This tool is something you can use yourself or share with others in your company. And yes, there is a grade at the end. Feel free to ping me if you’d like to discuss. Many years ago when I ran ThomasNet.com, we developed a sales tool that told our customers which companies were visiting their websites, and where those visitors were located. It was a big hit with marketing and sales leaders who gained insights on which prospects to contact and when. But we stopped there (and focused on other initiatives). Around the same time, a startup called Demandbase developed a related product. But Demandbase didn’t stop there. Their platform, based on the same kind of IP resolution technology we used at ThomasNet, was repurposed and extended to many other areas, including online advertising and marketing automation. Their work – and with other companies too – spawned a movement in the B2B marketing world: account-based marketing. 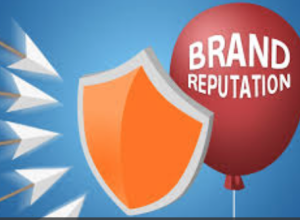 Advertise online to specific companies and target your message accordingly. You can also group types of companies together into segments, e.g. advertise more heavily to VIP prospects, launch “win-back” campaigns to lapsed/former customers etc. Prioritize sales calls and gain signals on buyer interest. If you’re selling to buyers at Lockheed-Martin based in Marietta, Georgia and you learn that three people from there went to your website this week, you better call them up…quickly. Personalize your website. Entire sections of your website can change, with tailored messages that automatically appear when visitors from specific companies – or segments – come to your site. This week, Demandbase announced that it has developed an account-based marketing for Oracle Marketing Cloud, which includes Eloqua (a leading marketing automation platform), and other technologies. There are other players in account based marketing besides Demandbase, and more affordable solutions, but they seem to be getting the most traction. For your product roadmap, think broadly about your product benefits. Demandbase’s core technology, IP resolution, helps you market and sell to specific companies – or specific groups of companies. That’s a broad benefit that has many, many applications. If you say it, and label it, you can own it. Demandbase coined a term, Account Based Marketing (or at least popularized it). They built a whole narrative in the industry around that concept, and what it means to marketing people. They are saying it loudly, and are beginning to own it. Partner to achieve scale, and get into your audience’s workflow. This is an oldie but a goodie. Demandbase partnered with ad networks to launch its online advertising solutions, and with marketing automation companies for its other offerings. Now, when thousands of marketers go about their daily work, Demandbase will be working behind the scenes. ThomasNet is a $100MM+ company, and has innovated in other ways. But Demandbase is a rocket that has taken off. Sell. Rinse. Repeat. Growing Your Company’s Recurring Revenue. Lately it seems that every product or service is available as a subscription. Angelist, the one-stop-shop for start-ups, now lists 714 subscription based ventures…almost of whom are trying to disrupt entrenched players in their industries. Subscription-based business models, with recurring revenue streams and predictable profits, are being used by companies who offer everything from Dog Treats to Home Maintenance to even Socks on a subscription basis. In the B2B world, beyond software and media companies, traditional players are trying to nip disruption in the bud and shifting to subscription models by offering customers a) all you can eat information, b) tiered/premium service levels, c) more convenience, d) more immediate information and e) business intelligence and analytics. Even IT services are being offered on a subscription basis. What functionality, information or service can your company provide as part of a subscription? How can you turn your customer relationships into more profitable, recurring revenue streams? If you’re chewing on these issues, we hope to see you in New York on May 4 at Subscription Insider’s Subscription Payment Accelerator. At this event you’ll learn how to extend the lifetime value of your subscribers and hear from experts at Disney, Vimeo and Education Week. Register by April 1 and save 25%. Use code BOUNDLESS25 when you register. Another example of how “subscription thinking” is spilling over into marketing departments in virtually every industry. Today Adobe is launching its next generation Marketing Cloud, an integrated suite of marketing technologies. One feature is Lifetime Value Decision, which employs behavioral data to figure out the kinds and sequencing of product offers that can generate the most revenue from a customer over time. Lifetime value analysis is one of the key pieces in a successful subscription strategy. Adobe is one of many technology players in a growing ecosystem that is supporting subscription based businesses. Companies like Cratejoy, ChartMogul and others are helping anyone get into the game. The tools are out there. Is your strategy? 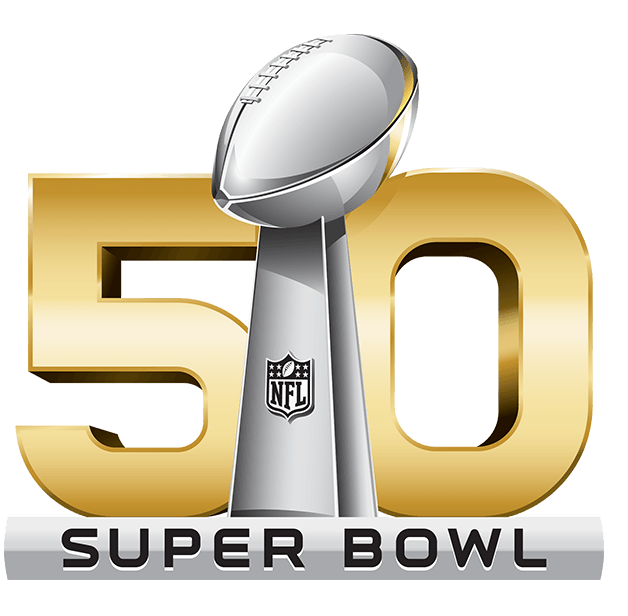 What are YOUR Super Bowl Moments? The Super Bowl is almost here, and with it, the media scrutiny of thousands of journalists who cover the event. All eyes are on the Panthers and Broncos, and their eyes are on each other—preparing strategies and refining playbooks (and fortunately they don’t have to check for under-inflated footballs). In business, every company has its version of the big game, a “Super Bowl moment.” It’s a make or break time when planning is paramount and every employee must be revved up. For retailers, that moment is Black Friday. This day kicks off the holiday season which generates about 1/3 of annual revenue in the retail business. On the last Black Friday, I went to a local Staples store to buy a few items. Simple enough? No. The customer experience was horrible. An inexperienced cashier fumbled the handling of my rebate check, had a poor attitude and with 4-5 other errors the entire experience – which should have taken one minute – took twenty five and left me feeling cold. This particular Staples store blew their Super Bowl Moment. 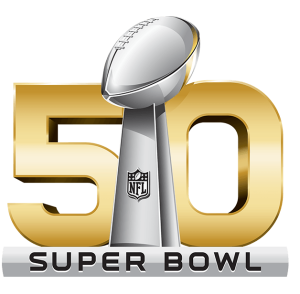 What are your company’s Super Bowl moments and how can you better prepare? Quantify the impact of each lever on sales and then improve them accordingly. Particularly in planning for Big Game Day. Think about how your best laid plans can come undone and how can you mitigate against those risks. Plan how your approach to Super Bowl moments can be part of your knitting every single day (for your regular season). There’s no excuse for poor performances during Super Bowl moments. And with proper planning and excellent execution, every day can be a victory. Drop us a line if you’d like to have a conversation about your business. Enjoy the game! In the digital world, driven by interaction and big data, there are many sophisticated ways to get customer feedback. Here a few…and I’m saving the best for last. Social media monitoring tools that mine and semantically analyze online discussions. These tools are getting more and more specialized for specific industries, e.g. there are different social monitoring platforms built specifically for restaurants and car dealerships. These days you can’t go anywhere in New York City without running into a hot dog vendor, an investment banker or someone who has developed a new social media monitoring tool. (And that’s even since Salesforce acquired Radian6). Online survey tools like Qualtrics that tie respondents’ attitudinal data from surveys to demographic and behavioral data that lives in databases and analytics software. They’re made even more powerful with overlays of transactional data. Platforms like Jive Software and Get Satisfaction that facilitate customer communities and integrate with social media, CRM systems and marketing automation tools. This takes “feedback” to the next level by making it actionable – by putting it right in the tools used by marketing and sales teams in the context of their workflow. You know things are far along when Gartner even has a Magic Quadrant for the space, called Social CRM. We regularly review marketing and sales technologies. And I’ve come across the best one yet…a technology so advanced and so powerful that it provides customer insights like nothing else. 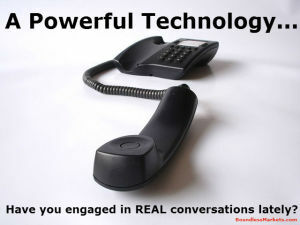 The main use case of this tool is a unique methodology called A Conversation. It’s a process where people actually listen. Unlike most marketing automation campaigns, Conversations can be two-way, responsive and consultative without being canned. We are advising all clients to pursue The Telephone and Conversations more deeply, and follow best practices in doing so, as part of their marketing and sales mix. And remember folks, you heard it here first. Want to engage in more conversations and make your company indispensable? Drop us a line if you’d like to discuss. Now that 2016 is here, it’s a good time to look back at last year through an honest lens and see what you’d like to improve in your business. One way to get there is to OBLITERATE your obstacles to revenue growth. But doing so requires buy-in, alignment and focus. Here’s a helpful framework we’ve used with our private equity and other clients to gain alignment around a focused plan. It’s done with what we call a Business Driver Matrix – a simple grid with five columns. Specifically, what’s holding back revenue growth? It’s not enough to say “our sales force is struggling” or “our brand isn’t strong enough.” If you’re going to win, you need to focus execution like a laser beam on specific problem areas or big opportunities. And hypotheses about those areas need to actionable. Last year, a Chief Revenue Officer asked us to interview some of her top leaders to drill down on specifics in an overall area she thought needed addressing. This helped create focus and gain buy-in on a better sales methodology for hundreds of sales reps at the company. Bottom line, it helps to be thoughtful about the way hypotheses are generated and refined, to ensure buy-in from the organization (and make sure focus is correct). There are processes to make that happen. Investment of resources, time and money are best made when you have evidence supporting the need. Hypotheses about revenue growth can be based on gut feelings, personal observations, employee feedback or other areas — but they should be supported with data. The stronger the evidence, the more confident you’ll be about choosing the area of focus. Analysis paralysis should be avoided. Data audits can identify critical knowledge gaps that can be filled with analysis, employee or customer interviews, and/or research. When doing a turnaround for a client last year, we quickly discovered a hidden but unacceptable lag time between incoming sales calls and the follow-up sales calls. We had a feeling this was the case, and hard data verified it. Fixing this issue (with CRM changes, training and processes) was part of a turnaround that took an underperforming company to double digit revenue gains. Actions to address hypotheses can be corrective (to fix things) or diagnostic (to better understand them and gain focus). Corrective actions are more self explanatory, but need specificity. For example, if sales training is needed, is it sales skills? Product knowledge? Systems or tools? Processes? The big questions are: What exactly? How? Who? When? Action needed: a win/loss analysis to uncover which kinds of deals were won and lost, and why. How big an impact will each initiative have on your business within the time frame you need? Each person on the team can assign a grade A-D, where “A” is the biggest impact…and discussions on these grades can reveal a lot about a team’s beliefs. How easy will it be to execute the initiative? Each person on the team can assign a grade A-D, where “A” is the easiest execution. When you’ve gone through this exercise, you’ll have a good sense of the assumptions held by your team and how they affect the organization. You’ll also gain confidence that you’re focusing on big drivers for your business. I come across dozens of startups every month. You never know when you might meet the next Uber. That said, there are so many clunkers out there — new ventures who are trying to solve small problems or who lack viable business models. 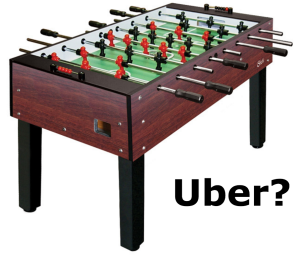 Below are summaries of actual new startup companies with seemingly iffy futures, starting with an app that uses algorithms to help people track their foosball games. You can’t make this stuff up. The summaries are not my own– they are directly from the companies in question. I’ve changed the names of these companies to not publicly bash anyone. The purpose of this post is not to excoriate some gutsy entrepreneurs who have big dreams. It’s simply to share a perspective on some very common problems with new ventures. To be blunt, some of these are examples of what not to do with digital products. Example: “Foozy.” Foozy is a digital service that tracks foosball results, skill rankings, and close match ups for companies that take foosball too seriously. Quantify your progress over time. Settle the debate of who’s the best in the office. Comment: This app might help the 24 people in North America who actually care. It’s one thing to have a focused business that deeply serves a market niche; it’s something else entirely to serve a small market and only provide marginal value. Example: “Cafe Work.” This is a community of people sharing information about seating, wifi, power outlets at local cafés. It helps people find spots to be productive. Perfect for freelancers, entrepreneurs and creatives looking to be productive. Comment: Is it that hard for people to find a place to be productive? There are over 11,500 Starbucks in the U.S., according to Wikipedia. And thousands of other coffee houses with decent wifi, fine seating and tasty lattes. Example: “FLeads.” The company is an online platform that synchronizes Facebook Lead Ads into any CRM, autoresponder or email software. This allows users to reach out to new leads automatically and in real-time, while benefiting from Facebook’s new two-click opt-in feature. Comment: Other companies are tackling this kind of issue as part of a broader feature set. And won’t Facebook eventually develop it themselves? Example: “HireNow.” With this service you can hire anyone from your locality or a remote place to get your daily chores done. If you are looking for some extra bucks or even full-time employment, get started on HireNow. Comment: what do they offer that Task Rabbit, Handy and dozens of other on-demand platforms don’t have? Earlier this year cleaning services company Homejoy shut its doors after three years in business, after revenue challenges and struggles in raising sufficient funding. Task Rabbit and Handy seem to be running away with the market. It seems too late for another player. Example: “Double Up.” This app knows the fun of dating doesn’t have to end when you’re in a relationship. We make it easy to find other couples with similar interests and help plan fun nights out. Comment: Ok, let me get this right. Two people who are dating are going to use an app to meet random new couples. Hmm. And the business model is what exactly? To sum it up, there are some very smart people who start their companies with narrow use cases and then successfully pivot into a broader application or market. It’s possible that some of the ones above could as well. For their sake, I certainly hope so.